I'm Ed Smith, a Berkeley Brain Injury Lawyer. Over the past few decades, the treatment of traumatic brain injuries has come a long way. Numerous imaging modalities, surgical procedures, and novel medications have been developed to improve the prognosis and recovery of patients everywhere. On the other hand, serious head and brain injuries are still significant medical problems that have the potential to adversely impact the lives of not only the patient but also their families. It is possible for a brain injury to have chronic complications and comorbidities that could last the remainder of the patient’s life. With this in mind, anyone dealing with a traumatic brain injury (TBI) should take note of some important information detailed below. Some brain injuries might go unnoticed. For example, the NFL has been in the media spotlight regarding concussions. Unfortunately, many of the professional athletes highlighted in the news did not even know that they had suffered a concussion. If the brain injury is not diagnosed, it is impossible to receive treatment. Returning to the field of play with an active head injury will only make the problem worse. Furthermore, this problem permeates down to the childhood level of sports as well. Therefore, anyone who has had any traumatic contact to the head should seek medical attention to ensure that they do not have a brain injury. What Causes a Brain Injury to Develop? While many people develop brain injuries while operating power tools, even someone who works in an office building can suffer a brain injury. For example, someone could fall and hit their head on their desk. Some individuals could tumble down the stairs. While these might not be classic causes of brain injuries, they are brain injuries nonetheless. A slip and fall accident has the potential to do serious harm. When someone slips and loses their footing, they often fall backward. This could lead to the back of their skull impacting the floor. This rattles the brain in its case and could cause the brain tissue to impact the back of the skull, leaving a significant bruise on the brain tissue. Someone operating a car, motorcycle, truck, or any other vehicle has the potential to suffer a severe head injury in an accident. An auto accident can lead to someone’s head striking the door, steering wheel, or dashboard. A truck accident can lead to a multi-car pileup where someone is ejected from the vehicle. Even the rider of a motorcycle who is wearing a helmet can suffer a serious head injury if their head impacts the pavement. When someone arrives at the hospital with concern for a head injury, the first priority is to stop any bleeding that has occurred. Blood loss can be estimated rapidly by using the heart rate and the blood pressure. Someone with a high heart rate and low blood pressure could have suffered a significant loss of blood. This means that not enough red blood cells are available to transport oxygen to the body’s vital tissues, such as the brain. Measurement of blood pressures in the brain is central to the management of a traumatic brain injury. The difference between the MAP and ICP is what drives blood flow to the brain. Blood moves from an area of high pressure to an area of low pressure. A small difference means that blood will not flow quickly between the two points, limiting the brain’s oxygen. As a patient loses blood, their MAP will drop. This could slow the flow of blood to the brain, worsening the injury. IV fluids and a blood transfusion could be given to raise the MAP and improve blood circulation to the brain. Intracranial hypertension (elevated blood pressure) can develop following an acute brain injury as the body rushes cells to the injury to start the healing process. If ICP goes up, the flow of blood to the brain could slow. Furthermore, an increase in ICP could cause the brain to swell. This increases the risk of a patient’s brain herniating, causing severe (or even life-threatening) brain damage. A patient showing severe symptoms of a traumatic brain injury could be given mannitol. This medication is used to rapidly lower a patient’s ICP. A patient could also be asked to hyperventilate. This will lower the amount of carbon dioxide in the patient’s bloodstream, helping to reduce the patient’s ICP. 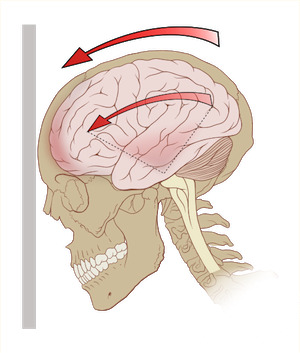 Any open head injury that breaks the surface of the skin creates a portal to infection. The skin is the body’s first line of defense against an infection. When this barrier is broken, bacteria and viruses can enter. An infection in the brain could lead to a brain abscess, meningitis, or encephalitis. All of these are serious infections that could require IV antibiotics or even brain surgery. Physicians may treat with prophylactic antibacterial agents to prevent an infection from setting in. Without adequate blood flow to the brain, patients may start to complain of intermittent vision changes. Examples include blindness in one eye (or a portion of one eye), a feeling of “bulging eyes,” complaints of “floaters,” or even passing out. These result from changes in intracranial pressure that could lead to intracranial hypertension. It could also result from a lack of flow to the eyes themselves or the occipital lobe. With rapid treatment, the vision symptoms could subside. Damage to certain lobes of the brain, such as the frontal lobe, could alter a patient’s personality. They could forget who they are. They could lose control over their judgment and inhibitions. They may also struggle to perform executive functions, such as doing laundry, paying bills, cooking, and cleaning. Depending on the severity of the injury, these changes could be permanent. These are only a few of the many complications that could develop following a traumatic brain injury. Someone who has suffered a brain injury is likely focusing on their medical recovery and not thinking about insurance claims. On the other hand, the financial results of a brain injury can devastate a family. Not only is the initial cost high but the cost of chronic treatments and rehab appointments can drag on for life. When this is combined with the potential to end someone’s career, it can devastate a family’s assets. Nobody should have to deal with the consequences of a brain injury alone. Those who have suffered a brain injury as a result of wrongdoing have the right to hold the responsible parties accountable for their actions. I’m Ed Smith, a Berkeley Brain Injury Lawyer. If you or someone you know has suffered a traumatic brain injury in an accident, please reach out to me at (510) 631-0200 for friendly, free advice. I have been inducted into the Million Dollar Advocates Forum for the state of California. This group of injury lawyers has been rated with some of the top accident lawyers from around the country. Each of the accident attorneys in our membership has settled cases or won verdicts of over $1 Million Dollars. You may want to view some of my verdicts/settlements. See what my past clients have to say about working with me: Avvo, Yelp, and Google.